Write a Little, Pick a Little! I, Benjamin S. Bradford, was born in 1932, in the heart (or trough) of the Great Depression. The first eleven years were spent as part of a sharecropper family. Those were the days one learned such old slogans as “Use it up, wear it out, Make it do or do without!” At 19 years of age it became necessary to leave for satisfactory employment, and Michigan was that destination. I have lived here since 1951, but I still remember! Since then I have written 11 books, 10 of them pretty well centered in Cullman and Morgan Counties, Alabama (along with a lot more of the rural south), the 11th one was located in Winchester, Tennessee. I have found since leaving that has for many years been just about the most interesting places on earth! I hope through my writing you can see those things through my eyes! Welcome to Benjamin Bradford Book Sales. For customer convenience SHIPPING IS FREE in the U.S.A.
A Combination of History, Pathos, and Humor! 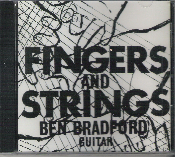 Benjamin S. Bradford is a published Author and a Guitarist that has released a CD, which is for sale below. Copyright © 2010-2019 Benjamin Bradford Books. All rights reserved.